It is with a great sadness that the colleagues of Jacques Wolfmann learned of his passing on Wednesday, 19 December 2018. After completing his university studies in mathematics in France, Jacques taught at the University of Quebec at Chicoutimi (from 1969 to 1971). Later, he spent his academic career at the University of Toulon in France, where he was named Professor in 1981, after having obtained the Doctorat d’Etat degree in 1978 in the area of Coding Theory, by the University of Paris 7. Then, he created a research team in coding theory, which became one of the first laboratories in France in this area. He became Professor Emeritus in 2006. Jacques was a true pioneer in France concerning the development of discrete mathematics, especially of coding theory. He contributed mostly to develop the theory of cyclic codes in various fields of arithmetic and discrete mathematics: two-weight projective codes, self-dual codes, negacyclic codes, sequences, bent functions, diagonal equations, for instance. His successful collaboration with his friend, Gilles Lachaud, notably on cyclic codes and Kloosterman sums, has been the source of the development of the theory of geometric codes in France. 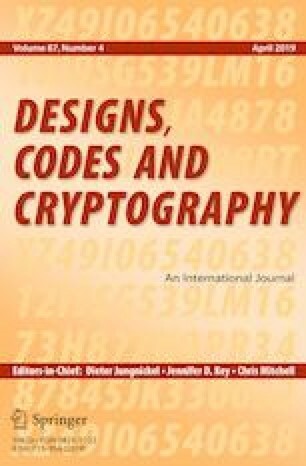 Jacques has been a Member of the Editorial Boards of Finite Fields and Their Applications since the start of this journal (January 1995) and, of Applicable Algebra in Engineering Communication and Computing as well as Designs, Codes and Cryptography, for several decades. Jacques was an outstanding educator, highly appreciated by his students and by the researchers of our community. All remember his constant availability and his unfailing enthusiasm to discuss any scientific problem. We remember his passion for music; he was the University Choir Director of Toulon for many years and gave many concerts. Jacques and his son Pierre, are survived by Jacques’ wife Denise, and daughter Isabelle. Below are major publications of J. Wolfmann. The complete list can be found at http://wolfmann.univ-tln.fr/. Wolfmann J.: A class of doubly even self dual binary codes. Discret. Math. 56(2–3), 299–303 (1985). Lachaud G., Wolfmann J.: The weights of the orthogonals of the extended quadratic binary Goppa codes. IEEE Trans. Inf. Theory 36(3), 686–692 (1990). Wolfmann J.: Almost perfect autocorrelation sequences. IEEE Trans. Inf. Theory 38(4), 1412–1418 (1992). Papini O., Wolfmann J.: Algèbre discrète et codes correcteurs. In: Mathématiques and Applications (Berlin) [Mathematics and Applications], vol. 20. Springer, Berlin (1995). Wolfmann J.: Are 2-weight projective cyclic codes irreducible? IEEE Trans. Inf. Theory 51(2), 733–737 (2005). Wolfmann J.: Projective two-weight irreducible cyclic and constacyclic codes. Finite Fields Appl. 14(2), 351–360 (2008).